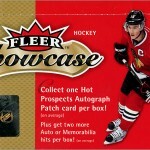 Fleer Showcase is the “I Love the 90s” set of hockey cards. 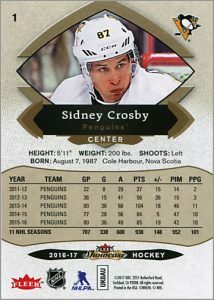 Many of the inserts found in this set use the same design as, or inspired by, hockey cards of the 1990s, along with some football and basketball designs too. Here we have Fleer Ultra, Flair — spelled F-L-A-I-R — Showcase, Fleer Metal Universe and other inserts that would make most kids from the 1990s smile. Oh yeah, there is a base set and some hits too. The Fleer Showcase base set is 100 cards and is totally rockin’ that “Photoshop Circa 1999” look, with an outer glow emanating from a player superimposed over a gold-colored background. We even get a gradient at the bottom, too. I’m not hatin’ here. The design may not be exactly original, but the cards really, ahem, showcase the player by drawing your eye towards him and away from the background. 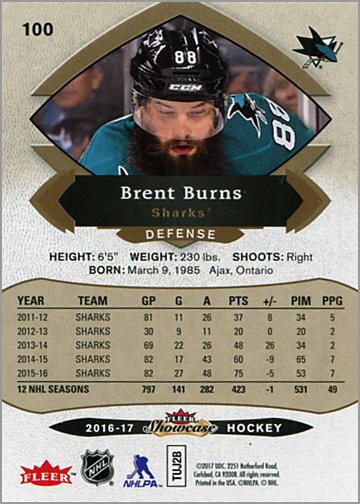 Card backs are pretty much what you’d expect here: five years of stats, vitals like height and weight, and a head shot; really just the same photo from the front. The card backs are organized, easy to read and have a nice flow to them — with your eye naturally being drawn to the photo at the top before moving down to the player name and finally the statistics. Of the 72 base cards in the box I opened, none were duplicates. 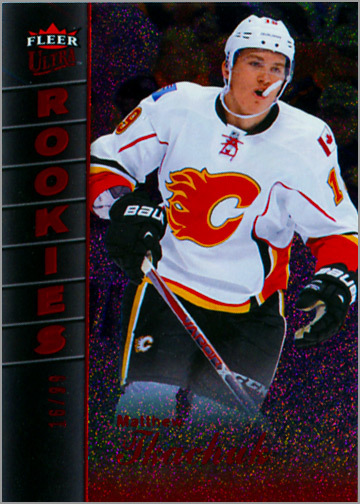 Numbered out of 499 copies and signed in Blue Sharpie Marker is this Hot Prospects Autos rookie card of Michael Matheson of the Florida Panthers. The autograph has been signed on a clear sticker that was later applied to the card. 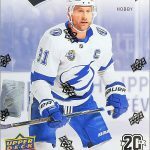 Some collectors don’t like “sticker autos” or “sticker-graphs,” but I have no problem with them so long as they are done well. In this case, Upper Deck did a great job. The design of the card is made to perfectly fit the sticker, which has in turn been perfectly applied to the card. Of course there are parallels! 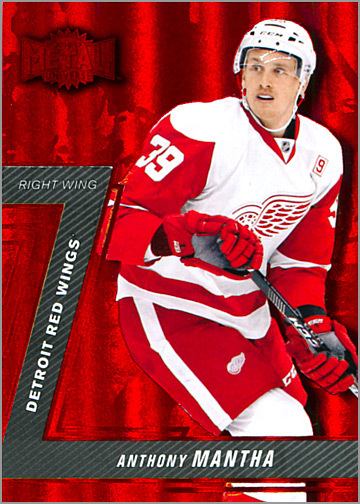 My box had three of these “Red Glow” parallels, which substitute the gold background for a red background. 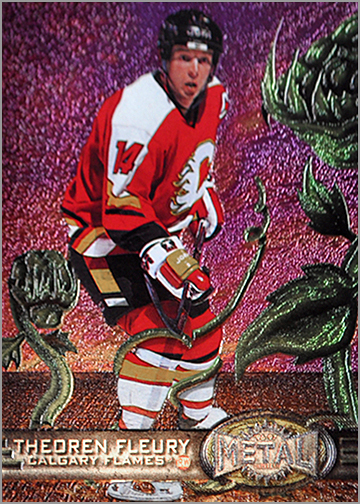 The player’s position at the very bottom of the card is also replaced with the words “Red Glow.” The reddish hues replace the gold tones on the back, too. 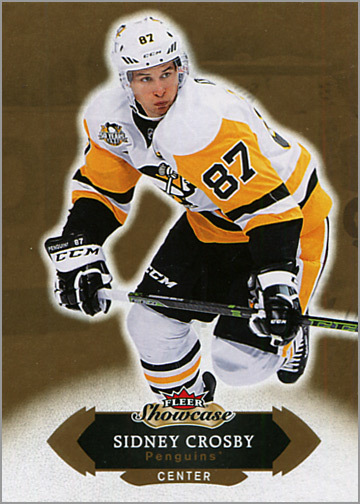 The most fun thing about Fleer Showcase is that it uses some old designs from past Fleer sets. Scoring Kings was an insert set from back in the 1990s that has been dusted off and used in this year’s Fleer Showcase set. Here, the players are superimposed in front of a shiny background of a sky with lightning. The cards are quite dramatic-looking, but unfortunately do not scan very well. But can we really call it Metal Universe if it doesn’t have a swarm of floating eyeballs or giant alien plants on it? 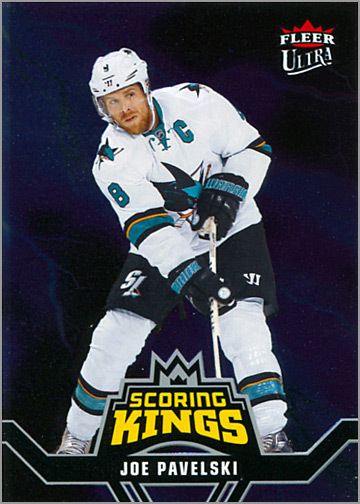 These cards are mainly silver, but like the Scoring Kings inserts also do not scan very well. A parallel of an insert because its Upper Deck. 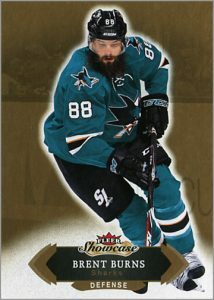 As you can see, this Precious Metal Gems insert does actually scan quite well. There are also blue and green versions of these Precious Metal Gems inserts. I could see myself building a set of these one day. 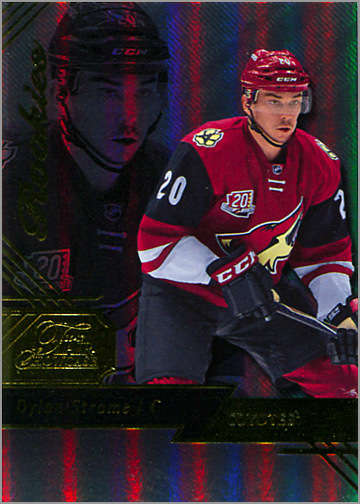 Two of these were rookie cards: Dylan Strome, above, and Pavel Buchnevich — which may become my new favorite hockey player name to say (booch-NEV-ich). The other two Flair Showcase cards were of John Tavares and Joe Pavelski. This would be a relatively-easy insert set to put together, since you get four per box. 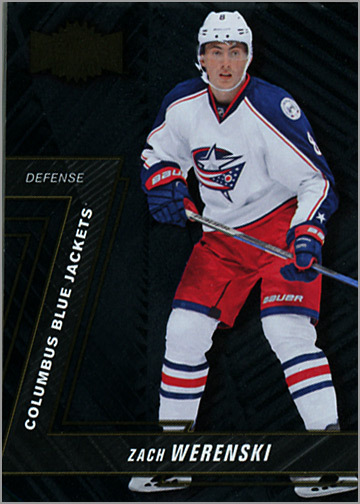 Ultra Rookies was another great hockey insert set from the 1990s. 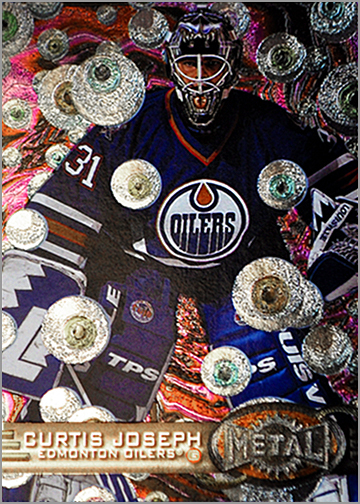 This card of Matthew Tkachuk has a shiny, glittery background and is actually the Platinum Medallion parallel, numbered out of 99, whereas the regular Ultra Rookies are serial-numbered out of 599 copies, and the Violet Medallion parallels are numbered out of 25. I hope you took notes, because there will be a quiz later on. 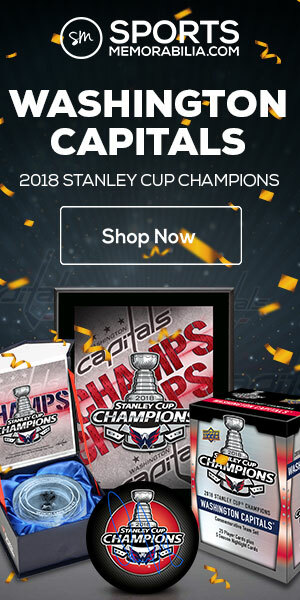 Whoa, slow down there, Upper Deck. It is actually the 24th anniversary of the inaugural Fleer Ultra set, which came out in the fall of 1992. This upcoming fall, would technically be the 25th anniversary, but whatever. 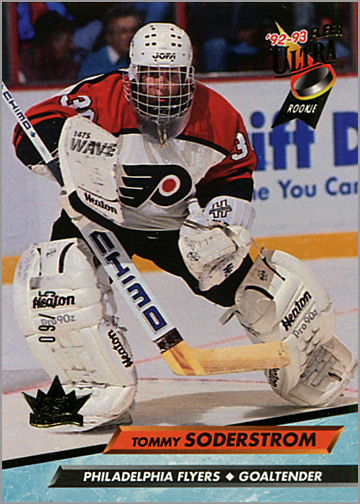 This card of former Flyers goalie Tommy Soderstrom has a gold-foil anniversary logo stamped in the lower-left corner and is numbered out of 25. 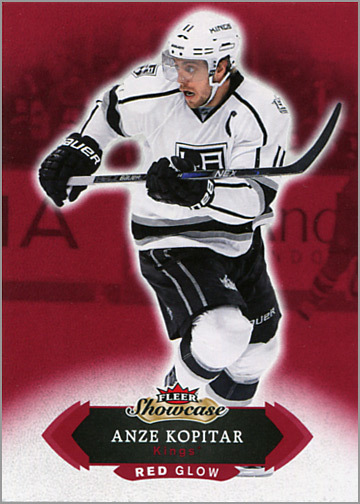 I am not too hype on other companies buying old Upper Deck cards and foil-stamping them as a special edition card, like this Chris Chelios card I bought in 2014. 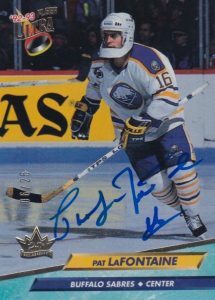 But I guess Upper Deck buying up old cards made by other companies and then re-releasing them as a special edition is slightly more legit — especially when they come autographed like this card of Pat Lafontaine in an astronaut helmet. 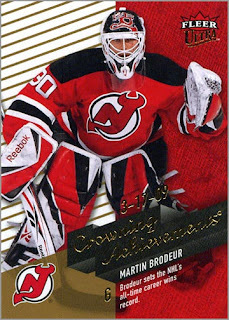 Regardless, I’m going to need the Chris Chelios, Ed Belfour and Jeremy Roenick buyback versions of these cards, so if you get one, hit me up. 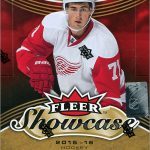 What I like about 2016-17 Fleer Showcase: The insert sets are reminiscent of the 1990s and give Fleer Showcase some variety. The base set has a simple, clean design, and the text on the back is easy to read. The sticker-graphs are well designed, too, cleverly integrating the autographed sticker on the card’s design. 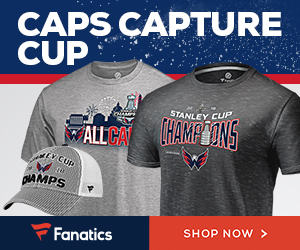 As a kid collector of the late ’80s/90s I’ve been intrigued by this product. Looks like a fun rip for the price, thanks for posting the break!